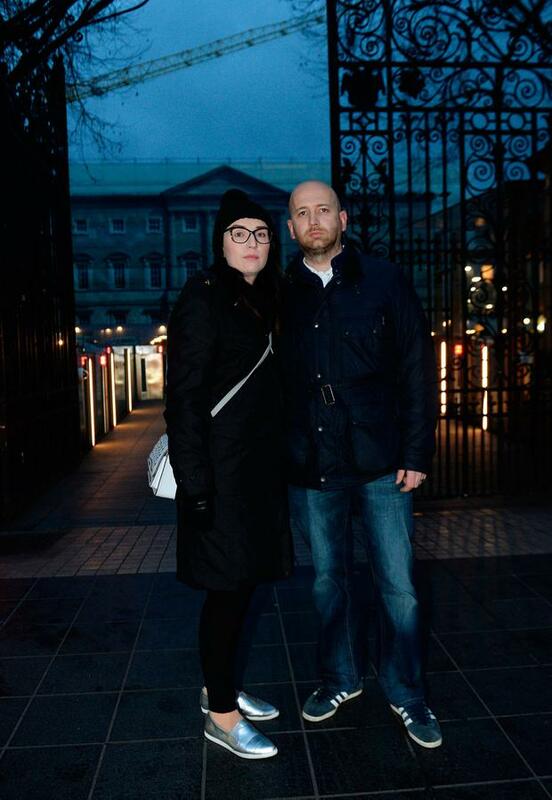 A Dublin couple who are caught up in the CervicalCheck controversy were among a group who staged a protest outside Leinster House to highlight their exasperation after Health Minister Simon Harris cancelled a meeting with them at short notice. Jennifer and Conor Blighe, are part of the 221+ CervicalCheck patient support group. Members of the group, including women and their partners, were due to meet Mr Harris this evening to discuss issues eight months after the revelations first emerged that audits of test results had not been passed on to all cancer victims. But they were told on Monday evening he would have to postpone it because he needed to be in the Seanad for the abortion legislation debate. Ms Blighe had two wrong test results after undergoing cervical screening in 2010 and 2013. She was only diagnosed with cancer in March last year. “It is very disappointing because we had sought a meeting with the minister to highlight various issues,” said Mr Blighe. He said the last-minute cancellation caused serious disruption to several women and families, some of whom had travelled to Dublin on Monday in order to ensure they were ready for the meeting. “To us he has more important business to attend to than be in the Seanad regarding the abortion bill. He said one of the issues they wanted to raise was the ongoing delay some women are still experiencing in securing access to their slides. One of leading campaigners, Stephen Teap, also criticised the cancellation saying it was “insensitive to those who have been through enough”. A spokeswoman for Mr Harris said: “The Minister wants to offer his sincere apologies for the short notice and indeed for having to postpone this very important meeting. “This is, unfortunately, unavoidable due to the significant time commitment required for the passage of legislation on Termination of Pregnancy in the Seanad. He is required to be in the Seanad all afternoon and evening up to 10pm. “The Minister had examined various options throughout the day with his officials and the Irish Cancer Society including attending for a shorter period of time.